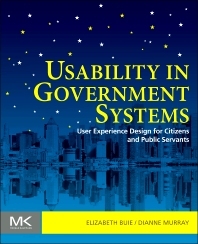 As a usability specialist or interaction designer working with the government, or as a government or contractor professional involved in specifying, procuring, or managing system development, you need this book. Editors Elizabeth Buie and Dianne Murray have brought together over 30 experts to outline practical advice to both usability specialists and government technology professionals and managers. Working with internal and external government systems is a unique and difficult task because of of the sheer magnitude of the audience for external systems (the entire population of a country, and sometimes more), and because of the need to achieve government transparency while protecting citizens’ privacy.. Open government, plain language, accessibility, biometrics, service design, internal vs. external systems, and cross-cultural issues, as well as working with the government, are all covered in this book. Usability/UX specialists and interaction designers working with the government; government and contractor professionals involved in specifying, procuring, or managing system developments. Don’t Make Me Deal with Government! Elizabeth Buie has 35 years of experience in information systems, of which over 30 have involved user interfaces, usability, and the user experience. Approximately 90% of her work has involved government systems of one sort or another, both internal and public facing. She has performed research, analysis, specification, design, development, and evaluation of human-computer interaction (HCI) for Web sites, Web applications, desktop and mainframe applications, and complex systems such as spacecraft control centres and air-traffic control applications. Her experience has also included several years in system engineering, which includes the specification and analysis of system and software requirements and the integration of the HCI process into the system life cycle. In the mid-1990s, Elizabeth initiated the effort to promote awareness of HCI in government systems. She co-chaired a workshop at CHI’95 and a SIG at CHI’96 and was one of the organizers of three symposia at the National Institute of Standards and Technology (NIST) on HCI in government. Elizabeth has master's degrees in mathematics and in human development, extensive technical and nontechnical writing experience, and proficiency in the Italian language. She serves on the editorial board of the UPA's online Journal of Usability Studies and served for several years on the editorial board of ACM’s magazine. She is co-chair (with Jhilmil Jain) of the User Experience Community for the CHI 2011 conference and is an Assistant Chair of the Usability, Accessibility, and User Experience subcommittee of the CHI2011 Program Committee. Dianne Murray has a joint degree in Computer Science and Psychology and has been involved in the Human Computer Interaction field since 1979, when she met MICKIE, the Medical Interviewing Computer (later to be exhibited at the Science Museum, London) in a doctor's surgery. Her first career was as a research scientist in a renowned UK government research laboratory. Her second career was as a university lecturer in the London area and her third as a Senior Research Fellow in a multidisciplinary research group in a 5*-rated University department. She has extensive experience of teaching Human Computer Interaction at both undergraduate and postgraduate level in a number of prestigious institutions and, since 1997, has been responsible for the HCI component of a University of London External Degree Programme, re-writing and updating the Study Guide some three times over the years. Her fourth career as a Usability and HCI consultant and her fifth as an academic journal editor have taken place in parallel. She has been continually involved in writing, researching and editing - academic papers, textbooks, technical reports and general audience articles on her specialist research subjects. She has extensive experience of acting as an editor for collected books of readings and conference publications and of producing material associated with specialist conferences. Her earliest experience was in producing computer-based training material and writing technical manuals for the MICROTEXT system (Acorn Publications, 1985). More recently she has produced reports and deliverables on technical matters for European Community-funded research projects, and gained much experience in managing, writing and submitting proposals for research funding, and acting as an expert Evaluator and Technical Rapporteur for the European Framework programmes of research. A founder member of interaction (originally the British HCI Group), she was the first Editor of its Newsletter (later the magazine, Interfaces) and has been General Editor of the international and interdisciplinary journal, Interacting with Computers, published by Elsevier Science, for 11 years, being Deputy Editor and co-founder for 10 years prior to that. Since the birth of her twin sons she has worked both as a part-time HCI and Usability consultant and as sub-contractor to her partner, Neil Sandford, at Putting People Before Computers. Now that her youngest children are at secondary school she intends to pursue her original research into adaptive interfaces and intelligent systems and to restart her interrupted doctorate in Human Computer Interaction.